Chris Dowsett was in junior high school when his family purchased a small vineyard in Forest Grove, Oregon. During school breaks he would work at the vineyard and, later, at the winery. He made his first wine with his father in 1983 – ten gallons of an Oregon Gewürztraminer. Flash forward to 2007. After working in California, Oregon, and Washington, Dowsett was working as the resident winemaker at Artifex, a custom crush facility in Walla Walla. As part of the position he was able to produce 300 cases of his own wine. Dowsett Family Winery was born. Over the years Dowsett has maintained a passion for the grape he made his first wine from. “I love a dry Gewürztraminer, with good acidity…It works so well with foods that sometimes are difficult matches with wine. Try it with spicy Thai or Mexican, salty foods like Ham or other cured meats or seafood like Scallops or clams,” he says. In addition to the Gewürztraminer, Dowsett also makes a Grenache, Syrah, and Mourvedre blend called Devotion Red. Dowsett currently works at Walla Walla’s Buty Winery, assisting winemaker Caleb Foster. Future Dowsett wines will be made at this facility. While he says he would like to make a bit more of his white wine, Dowsett wants to keep the winery very small. A fingerprint adorns the Dowsett Family Winery label. In choosing the family name for the winery Dowsett says, "We wanted something that would be reflective of the fact that we were a small family winery, that focused on producing a few wines that were grown, fermented and supplied with packaging by people we considered friends or family." 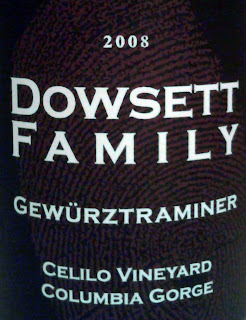 The 2008 Dowsett Gewürztraminer hails from Celilo Vineyard. Located in the Columbia Gorge, Celilo is one of the premier sites for white wine grapes in Washington State. The vines for Dowsett’s 2008 wine come from a block planted in 1984. Unlike most vineyard managers in the state who have to irrigate their vines, Rick Ensmenger and his team at Celilo are able to dry farm this block and others due to the higher-than-average rainfall of the area. Both the age of the vines and the experience of the winemaker with this grape show on this sensational effort. I purchased this wine from Full Pull Wines which continues to impress with their weekly, handpicked offerings (and take a bite out of my wallet I might add). Rating: * (Excellent) A thrilling nose with loads of floral aromas, melon, apples, and acidic notes. Crisp and acidic with a dollop of grapefruit on the palate. An excellent wine that demands food to be fully appreciated. 100% Gewürztraminer. 13.9% alcohol. 100 cases produced. Had this about 3 months ago at a friend's house and was floored at how good it was. Easily the best gewurz in the state. Would compliment Thai food extremely well. I'm a buyer! Sean - Nice writeup on a truly outstanding wine. I'm glad you enjoyed it as much as I did! Jared, indeed, can't think of a better Gewurz I have had from Washington. Paul, keep up the good work! Thanks for the comments. I have not tried the '08 yet - I'll have to do that soon. I know Chris and actually worked harvest last year at Artifex. He's a cool guy - he brought over a New Zealand Gewurztraminer for a little impromptu tasting a couple weeks ago that was quite intriguing. Steven, definitely a wine to seek out. Thanks for the comment. Chris was my neighbor when I lived in Walla Walla. He's a great winemaker and it's great he's got his own line of wines. Dry Gewurtz... awesome! Hard to find dry ones from WA. I've already talked to him about a trade. Craig, you'll have to barter something precious for this one I'm afraid. Thanks for the comment!